Rita Stradling is a YA author whose work I will always follow without question – I’m not a fan of YA in general but Stradling is amazing. This book is outstanding, the characters are complex and well developed and the world building was something special, somewhere between regency period and magical fantasy. Annabelle, the main character, is the daughter of a low-level aristocrat and she treads the line between being an aristocrat and being a commoner, which is something that makes her social interactions with both sides of the fence really interesting. She deals with her terrifying condition very convincingly – she’s proud, but she’s also not stupid. She has a strong moral compass and won’t let anyone risk themselves for her sake, but she does everything she can to stand by her friends. Best of all? She’s too damn busy dealing with her condition and the conspiracy taking place in the world to go around kissing smelly boys! She’s not Katniss levels of grumpy, but she’s not all sunshine and jellybeans – smooching the first boy to show an interest in her would have spoilt the book for me and Annabelle is not about to let herself or the reader down like that! The world itself has many secrets that we have to wait to see uncovered – I’m hoping that some of these will be revealed from the perspectives of other characters because I was impressed with the complexity of all of them and feel like each one would have a unique perspective on what’s going on in the world around them and the adventures they undertake. I’m so excited to learn that this is going to be a series because I’ll be following this one with great interest. The ending of this book was a little bit odd because it felt rushed and without a huge cliffhanger, I thought it had just been condensed so as not to go over a pre-determined word count…. if this had been a standalone novel, I would have been disappointed, as it is – I’m just ready for book 2. 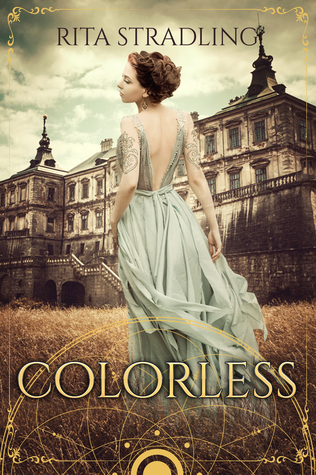 On a non-review note, writing the word ‘Colorless’ without a ‘U’ in it hurt me on a spiritual level. Just sayin’. Also, is it just me or does the synopsis give away a little bit too much of the story?